The ACIIS is the first flagship Summit hosted by place4BRICS. It builds on place4BRICS’s highly successful event series for start-ups seeking venture capital funding, that have been held since 2011. The objective of the ACIIS is to deliver evidence-based scenarios using African start-ups (pre and post VC funding) within high growth creative sectors. It aims to showcase the economic opportunities to the network of development financial institutions, private equity, limited partners, venture capitalists, and family offices in and around London. The Summit will be the first of its kind outside Africa to feature a formidable panel of notable speakers from the creative industries including business leaders, policy makers, and entrepreneurs. The sectors in focus are: advertising, arts, broadcasting, fashion, film, music, and publishing. The theme of this first Summit is entitled “BUSINESS MODELS AND INVESTMENTS IN AFRICA’S CREATIVE INDUSTRIES” and the day event will be held at The Africa Centre in Covent Garden, central London. The Board of the NEPAD Council also endorsed the African Creative Industries Investment Summit stating that the summit is ‘addressing some of Africa’s developmental needs’. Confirmed speakers include Obi Asika (Storm 360, Glu Africa), Omar Ben Yedder (IC Publications), Dr. Nicola Searle (UK Intellectual Property Office), Dr. Shiyghan Navti (IBM), Josette Matomby (African Fashion Week), Nathan Asiago (Kenya Film Commission), Sinem Bilen-Onabanjo (FAB Magazine) and Prof. Johanna Gibson (Queen Mary University of London). Media partners include IC publications (New African and African Banker), BRICS Business Magazine and afrimind. The summit will conclude with an exclusive invitation-only closing reception sponsored by Black Women Mean Business, which will be hosted by Diane Abbott MP at the UK House of Commons. 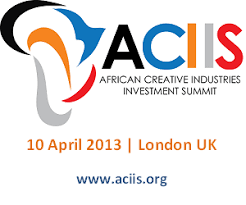 For more information about the African Creative Industries Investment Summit (ACIIS) and to reserve tickets for this event, please visit: http://www.aciis.org. For further information including on partnership and/or sponsorships, please send an email to Sandy Sah sandy@place4brics.com or hello@place4brics.com or call +44 (0) 78 3014 3489.